Polbase - Reference: Crystal structure of a DinB lesion bypass DNA polymerase catalytic fragment reveals a classic polymerase catalytic domain. Crystal structure of a DinB lesion bypass DNA polymerase catalytic fragment reveals a classic polymerase catalytic domain. The UmuC/DinB family of bypass polymerases is responsible for translesion DNA synthesis and includes the human polymerases eta, iota, and kappa. 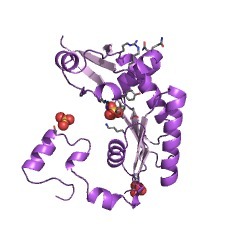 We determined the 2.3 A resolution crystal structure of a catalytic fragment of the DinB homolog (Dbh) polymerase from Sulfolobus solfataricus and show that it is nonprocessive and can bypass an abasic site. The structure of the catalytic domain is nearly identical to those of most other polymerase families. Homology modeling suggests that there is minimal contact between protein and DNA, that the nascent base pair binding pocket is quite accessible, and that the enzyme is already in a closed conformation characteristic of ternary polymerase complexes. These observations afford insights into the sources of low fidelity and low processivity of the UmuC/DinB polymerases.